A new award to I-TECH seeks to fight the spread of HIV in Zimbabwe by rapidly scaling up training and mentoring of the country’s medical staff. The $42.9 million award from the Centers for Disease Control and Prevention (CDC) will enable I-TECH to support the country’s Ministry of Health and Child Care (MOHCC) in training healthcare workers throughout the country in an integrated approach to care and treatment of HIV. This will also involve developing a robust clinical mentoring program using innovative approaches such as distance learning and live phone, email, text, and online support. I-TECH will also support the MOHCC in storing and tracking clinical training data in a comprehensive, adaptable and user-friendly database called TrainSMART. “This project represents a massive scale up of clinical training and mentoring in Zimbabwe, and we’ll be working with a large number of local partners to achieve it. 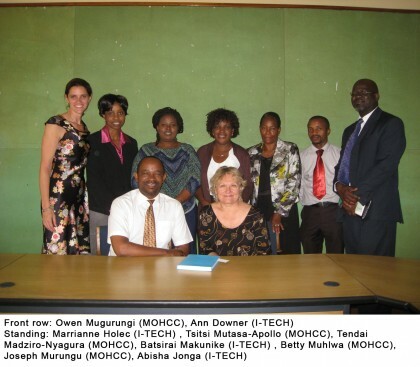 As usual with I-TECH, the efforts of all partners are focused on capacitating the MOHCC to provide sustained leadership in clinical training for the country,” said Ann Downer, Executive Director for I-TECH and Principal Investigator on the I-TECH Zimbabwe training grant. I-TECH training is grounded in adult learning theory and is based on years of on-the-ground training experience. It makes use of interactive teaching methods to enhance the impact of teaching content. I-TECH has been a leader in the integration of multimedia resources—including drama and documentary storytelling—into training packages. These approaches support learners in gaining knowledge and skills that will lead to changes in practice and, ultimately, to improved patient outcomes. Zimbabwe is a country of 14 million people in southern Africa. All of I-TECH’s efforts in Zimbabwe are implemented with an eye to sustainability, efficiency, and local ownership. The Ministry of Health and Child Care is committed to universal healthcare access in Zimbabwe, including scaling up antiretroviral therapy (ART) services in all of the country’s 1,500 health facilities. Training and mentoring are critical components in helping MOHCC achieve this monumental goal. “We now have to take treatment to the people,” declared Dr. Owen Mugurungi in the kickoff meeting with I-TECH. Dr. Mugurungi is the Director of AIDs and TB Unit for MOHCC and has been with MOHCC since the inception of the ART/OI program. Through this award, I-TECH will work closely with MOHCC and local partners to conduct more than 60 trainings for health care workers annually, revise the country’s HIV Integrated Training Curriculum, assist in building a robust mentorship program, and implement the TrainSMART program to track the effectiveness of the trainings.